Béla BARTÓK: Second Sonata for Violin and Piano, Sz. 76 (1922). Alfred SCHNITTKE: Sonata No. 2, “Quasi una Sonata” (1968). Witold LUTOSŁAWSKI: Partita for Violin and Piano (1984). Miranda Cuckson (vln), Blair McMillen (pno). ECM 2446 (1 CD) (http://www.ecmrecords.com/). 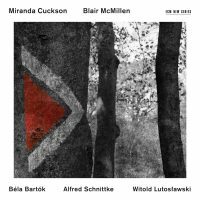 Cuckson and McMillen emphasize the folk and improvisational aspects of Bartók’s Sonata. They avoid over-Romanticizing what is often elsewhere presented as a classic duo. Theirs discovers a casual accompaniment and neutral string timbres. With coarse harmonies and a rhythmic engine requiring a few cranks before it hums, the two-movement Sonata emerges brooding and severe, wonderfully modern and unfamiliar. The Schnittke circumvents the typical Sonata for violin and piano. Alternately comedic and tragic, alluding to other works or devolving into clusters and noise, violin and piano fling gestures and fragments. I suspect the piece works better in performance when there is at least one person in the audience who would be astonished by Schnittke’s antics. 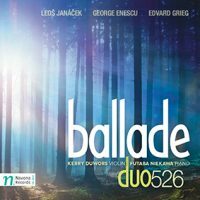 On this recording, traditional approaches to the genre bracket the constrained bedlam, even though Lutosławski’s Partita presents its own contradictions as it ogles past forms. 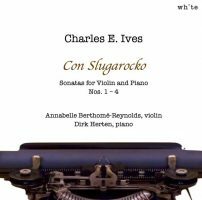 “Con Slugarocko.” Charles IVES: Sonata No. 1 for Violin and Piano (1901-17); Sonata No. 2 for Violin and Piano (1901-17); Sonata No. 3 for Violin and Piano (1901-14); Sonata No. 4 for Violin and Piano, “Children’s Day at the Camp Meeting” (1900-16). Annabelle Berthomé-Reynolds (vln), Dirk Herten (pno). White (Bruxelles) 2016 (1 CD) (http://www.white-records.com/). Ives is hard musically and conceptually. Freewheeling dissonance may keep mainstream interpreters at bay, but there are those who take the technical problems in stride only to be baffled by the popular tunes and deceptive harmonies. A successful pass at the violin and piano sonatas ought to draw some sweat and present a wee bit of coarseness. Berthomé-Reynolds and Herten provide the right amount of practiced inexactitude. In No. 1, the material that also appears verbatim in Symphony No. 4 has a delightful swagger and reflection of the orchestral palette. When Ives lands on the wrong key or takes an unexpected turn, Berthomé-Reynolds and Herten express their surprise along with a pinch of admiration. The longest sonata, the nearly half-hour No. 3, may be the most wearying and meandering. The most abrupt, the 10-minute No. 4 which contains Ives’ con slugarocko marking, is a gem. Leone SINIGAGLIA: Le Baruffe Chiozzotte: Ouverture, Op. 32 (1907; arr. Ernesto CONSOLO, 1907)1; Zwei Klavierstücke, Op. 24 (1903)2; Fogli d’album, Op. 7 (1897)3; Staccato-Étude, Op. 11 (1900)4; Sonata for Violin and Piano, Op. 44 (1936)5; Danza Piemontese, Op. 31, No. 1 (1905)6. Alessandra Génot5,6 (vln), Massimiliano Génot1,2,3,4,5,6, Carlo Negro1 (pno). Brilliant Classics 95239 (1 CD) (http://www.brilliantclassics.com/). In the notes, pianist Génot discloses that Schumann, Brahms and Dvořák were Sinigaglia’s models. However, none of the Italian’s predecessors could also claim to be a famous mountain climber who achieved the first ascents of several peaks in the Dolomites. Sinigaglia died in Turin in 1944 as he was being arrested by Nazis. The early, solo piano numbers are slight: The concluding Scherzino of the Fogli d’album could be a discarded Schumann draft. The harmonic motion of the Capriccio, Op. 24, No. 1 fidgets like late Brahms. The dignified Violin Sonata approaches the half-hour mark, its three movements reflecting a keen attentiveness to Romantic models. Yes, it’s more interesting than Respighi’s. A lively arrangement of an orchestral dance concludes the program, matching the spritely four-hands piano overture which started it. This is an appealing sampler for a forgotten composer. Erich Wolfgang KORNGOLD: Suite from Much Ado About Nothing, Op. 11 (1921); Marietta’s Lied and Tanzlied des Pierrot from Die Tote Stadt, Op. 12 (1920). Aaron COPLAND: Sonata for Violin and Piano (1943); Two Pieces for Violin and Piano (1926). Yuriy Bekker (vln), Andrew Armstrong (pno). Navona NV6046 (1 CD) (http://www.navonarecords.com/). Korngold’s four-part Much Ado About Nothing suite is an infrequently encountered sumptuous vehicle which we ought to hear more often. Bekker has opportunities to sing, abetted by the 1686 Ex-Nachez Stradivarius. Further confirmation of Korngold’s melodic gift are the two arrangements from Die Tote Stadt. These dramatic excerpts come from Korngold’s operatic career before he ended up in the U.S. and wrote film scores. Copland’s unfussy Sonata establishes a more equal partnership between violin and piano. The earlier Two Pieces suggest Copland always wrote in an approachable American style, but we’re hearing Americanisms pasted onto Franco-Germanic forms. Same players, same violin, but different composers, and it’s evident that the Strad responds well to Korngold. 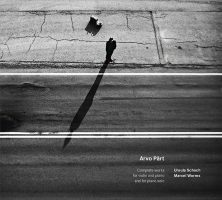 “Complete works for violin and piano and for piano solo.” Arvo PÄRT: Fratres (1977; 1980)*; Two Sonatinas, Op. 1 (1958-59); Variationen zur Gesundung von Arinuschka (1977); Vier leichte Tanzstücke (1956/57); Partita, Op. 2 (1959); Spiegel im Spiegel (1978)*; Für Anna Maria (2006); Ukuaru valss (1973; 2010); Diagramme (1964); Für Alina (1976); Passacaglia (2003)*. Ursula Schoch* (vln), Marcel Worms (pno). Zefir Records ZEF 9641 (1 CD) (http://www.zefirrecords.nl/). 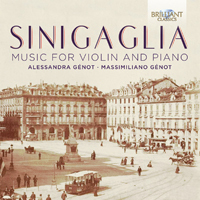 The three violin and piano compositions serve as anchors: Fratres at the start, Passacaglia at the end, with the broad Spiegel im Spiegel functioning as a welcome island in the middle. Worms and Schoch do not linger. Those who like to bathe in Pärt’s sumptuousness might be disappointed; I find that an unfussy approach actually lingers longer in the mind. Whereas the program opens with Fratres, an iconic work written in Pärt’s pervasive tintinnabuli style, the majority of the Estonian’s solo piano pieces were written decades before in the 20th-century’s predominant styles. Worms’ recorded repertoire includes Satie and Glass which suggests sympathy to minimalism’s guises, however his early Pärt is pragmatic, well suited to the two Sonatinas and the jazzy Partita. The Four Dances are briskly dispatched music-box moments that could be encores. Worms discovers irony in the naïve Ukuaru valss. Diagramme is a flighty serial inkblot test performed with gusto. Contrasting other traversals of Pärt’s piano oeuvre, Worms skims the pool’s surface, transmitting Für Alina in 2:20 as opposed to Van Veen (Brilliant Classics 94775), who plunges deep with four varying takes powered by octave transpositions (20:18, 2:42, 3:15, and 23:07). Worms presents Für Anna Maria twice (at 1:06 and 1:05), exploring articulation rather than duration. “Music for Violin & Piano.” Roger SESSIONS: Duo (1942); Adagio (1947); Waltz for Brenda (1936); Sonata for Violin (1953); Second Sonata for Piano (1946). David Bowlin (vln), David Holzman (pno). Bridge 9453 (1 CD) (http://www.bridgerecords.com/). 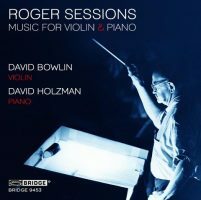 The big offering here is Bowlin’s vibrant reading of Sessions’ grand Sonata for Violin. Much has been made about how Sessions stumbled onto serialism with this piece, but Sessions was nothing if not deliberate, and his gradually evolving style had been inching towards dodecaphonic methods. The Sonata twists and turns across four movements. The Duo, a single-movement sonata allegro, is the only programmed item requiring both Holzman and Bowlin. They make what is difficult sound comfortable. Sessions’ Piano Sonata No. 2 is impulsive. Prokofiev comes to mind, though to establish actual influence might take detective work given the tight chronology. By unusual coincidence, Holzman’s timings for each of the three movements, including an explosive opening and a dynamic concluding third, hover around 4:30. The notes reveal that Sessions disliked “composing to order,” meaning that he was not inclined to deliver occasional pieces according to schedule. However, Holzman has found two tiny piano items: The 3:23 Adagio, a Schoenbergian trifle, commemorates a retiring Berkeley colleague, Monroe Deutsch, and the wee 1:26 Waltz for Brenda, where Satie meets Prokofiev, was written for the birth of a neighbor’s daughter, who grew up to be the author Brenda Webster. “Ballade.” Leoš JANÁČEK: Sonata for Violin and Piano (1914). Georges ENESCU: Sonata No. 2 in F minor, Op. 6 (1899). Edvard GRIEG: Sonata No. 3 in C minor, Op. 45 (1887). Duo526: Kerry Duwors (vln), Futaba Niekawa (pno). Navona NV5952 (1 CD) (http://www.navonarecords.com/). An engaging program in reverse chronological order that slots the most conventional item at its end. Each Sonata aims to balance emerging Nationalism with Classical forms. The Janáček is the most exotic, as it replicates halting speech and proceeds independently of standard designs. Enescu declared that his second sonata was where he first successfully incorporated folk music and “found his voice.” Grieg’s most popular violin sonata is conservative in structure, a piece of overstuffed furniture that anchors a room. The less liquid Enescu gets the shortest stick: Duwors and Niekawa relish the Janáček’s gutsy interactions and the Grieg’s formality. “Stefan Wolpe Vol. 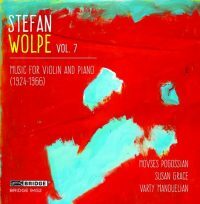 7: Music for Violin and Piano (1924-1966).” Stefan WOLPE: Second Piece for Violin Alone (1966)1; Duo for Two Violins, Op. 2 (1924)2; Two Studies for Two Violins and Piano (1933)3; Sonata for Violin and Piano (1949)4; Second Sonata for Violin and Piano (fragment) (1958/59)5; Piece in Two Parts for Violin Alone (1964)6. Movses Pogossian1,2,3,4,5,6, Varty Manouelian2,3 (vln), Susan Grace3,4,5 (pno). Bridge 9452 (1 CD) (http://www.bridgerecords.com/). 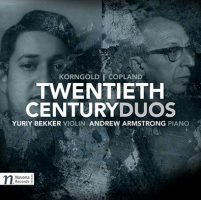 This program of artful Wolpe shards focuses on violin works, including premiere recordings of an early two-violin Duo, and Two Studies for the less modern combination of two violins and piano. It appears that the Second Piece for Violin Alone, with its great declarative title, continually coils together short gestures and slightly longer, slightly more melodious motives. Wolpe enjoys lining up small chips and gestures into two-part structures, down to the micro-level. The 1949 Violin Sonata is ardent and argumentative. Passionate playing extends into the fragment of what would have been a second violin sonata. I heard unexpected touches of Stravinsky in the Piece in Two Parts.